XCU02Z TOOL ONLY, charger is not included, batteries is not included. 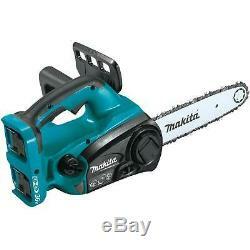 Makita 18V X2 36V LXT Lithium-Ion Chainsaw (Bare Tool). 18V X2 36V Cordless LXT Lithium-Ion Chainsaw (Bare Tool) - XCU02Z. Makita-built motor delivers 1650 FPM for increased cutting speed. Two 18V LXT Lithium-Ion batteries deliver the power and run time for corded demands without leaving the 18V LXT platform. Lower noise level at only 89 dB(A) for improved user comfort. Guide bar for increased capacity. Tool-less chain adjustment for convenient operation and maintenance. Front hand guard engineered to actuate chain brake when engaged. Zero emission and reduces maintenance with no need to change engine oil or spark plug, clean air filter or drain fuel for storage. Ergonomic top handle design at 24-5/8 in. Long with less weight only 11.2 lbs. Convenient top handle design with ergonomic grip is engineered for the user to more easily apply even pressure when cutting. Instant start-up: simply load two 18V LXT batteries and the saw is ready to use. The item "Makita XCU02Z 18V X2 LXT Lithium-Ion (36V) Cordless Chain Saw MADE IN JAPAN" is in sale since Tuesday, January 15, 2019. This item is in the category "Home & Garden\Yard, Garden & Outdoor Living\Outdoor Power Equipment\Chainsaws". The seller is "we-always-open" and is located in New York, New York. This item can be shipped worldwide.